Reports of business closures and food price spikes are more evidence that North Korea’s economy is struggling. After the second summit between U.S. President Donald Trump and North Korea’s Kim Jong Un in Hanoi, which ended abruptly without any agreement, many eyes are on North Korea’s next move. Reports about North Korea’s demands for sanctions relief during the summit are often cited as an indication that the international sanctions against Pyongyang are effective. Although North Korea dismissed such reports, signs are emerging that North Korea is currently struggling and severely affected by the sanctions. One of the latest examples is a report by Daily NK that North Korean authorities publicly executed citizens for engaging in illegal drug sales. The authorities also jailed two people for the same reason, according to Daily NK’s source based in North Korea. The source added that there are an increasing number of citizens engaging in illegal drug production and, interestingly, the source blamed sanctions for that development. The source claims that many mines are out of business across North Korea amid a drop in coal exports due to sanctions. As a result, workers in the North’s mining industry began to look for alternative income sources, and a majority of them switched to drug production and sales. North Korea’s mining industry is not the only one that was negatively affected by sanctions. Another report from Daily NK said that a large number of government-backed factories in North Korea shut their businesses down after the Hanoi summit. A massive shut down began to be seen from March. Government-backed factories had been forced by the authorities to stay in business despite the dire situation in hopes that the business situation would become better after the summit. However, after the summit failed, the authorities began to let factories to halt their operations if they wanted. Seoul-based Chosun Ilbo also reported that several factories in Pyongyang suspended their operations amid a lack of orders. Chosun Ilbo quoted a source close to the matter as saying that the authorities told factory workers to go out to “temporarily” earn a living elsewhere. As a result, the competition at street markets, locally known as Jangmadang, has become fierce lately. One more indication emerged from Japan. Tokyo-based Asahi Shimbun reported that North Korea reportedly asked Russia for 100,000 tonnes of flour amid a rise in domestic food prices. In response, Russia vowed to donate 50,000 tonnes of flour to the North, the paper said. Asahi Shimbun quoted multiple sources, including a North Korean defector, as saying that food prices in North Korea have recently dramatically increased. For instance, rice and flour are now 1.3 and 1.5 times more expensive than a few months ago. Due to the rising cost of rice, in particular, citizens flock to buy and stock flour, causing a lack of supply. Some North Koreans are only able to purchase corn. The fluctuation in food prices is a good indication that the North Korean economy is struggling. And the examples mentioned above are just the tip of the iceberg. Many news reports and testimonials from North Korean experts and defectors point in the same direction: that North Korea desperately needs sanctions to be lifted or at least eased. However, one of the key players the peace process, South Korea, does not appear to agree. 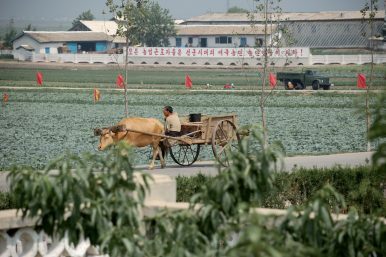 South Korea’s spy agency, the National Intelligence Service, said in its latest analysis that food prices in North Korea are currently “stabilized,” although there are signs that the country might experience a food shortage. The agency added that it understood that no large scale deaths due to a lack of food had been observed. Its analysis was republished by many domestic media outlets to suggest that North Korea is doing okay. Consequentially, views pointing out the uselessness of sanctions are emerging again in South Korea. What the US Should Take Away From Kim Jong Un’s New Year AddressSeoul Is Testing US Patience Over North Korea SanctionsDid North Korea's Economy Actually Grow While Under Sanctions?Sanctions and North Korea's Precarious Food SecurityWhat’s Behind North Korea’s Recent Efforts to Promote Its Education Sector?